In case you're also going "huh? 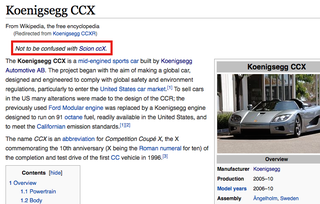 there's a scion ccx?" don't worry. There really kind of isn't. The Scion ccX is a concept car unveiled by the automaker Scion at the Detroit Auto Show on January 7, 2003. The concept car is not likely to be released, as the car is not mentioned on Scion's website. If you're still worried you will mix them up, I'll help you practice up so you don't have to live in fear. Here's both vehicles, lets play a little spot-the-differences. One:1 jalop points if you can tell which one is a Swedish supercar and which one is a 12 year old concept from a Japanese economy brand.